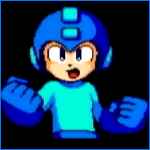 Rockman Corner: Rumor: MegaMan 9 Coming Sooner Than We Think? Not at the moment. However, tomorrow is the day to be on the lookout for news. We should learn a lot more RM9 details at Capcom's press conference. I really hope this one's true, and I wouldn't be surprised if it was, given your track record, Protodude. Aug 18th? Oh that would be awesome! But since MM9 has flip flopped so many times on what system is was going to be on, I won't get my hopes up.